Succulent strips of tender chicken smothered in a rich and tangy tomato sauce. Loaded with cool herb sour cream and wrapped in a soft and toasty flour tortilla. This Mexican staple has all the flavour of El Paso, without the heat. 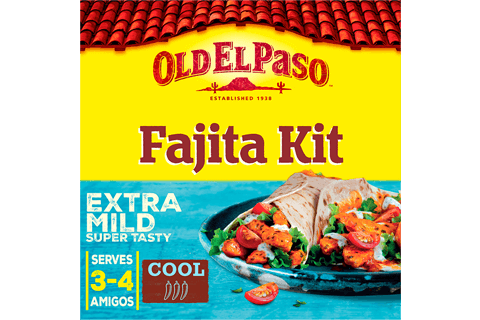 To throw these tasty fajitas together, slice the tender chicken breast into thin strips. Add a splash of oil to a hot pan and stir-fry the chicken until lightly browned. Throw in the rich tomato sauce and stir in with the tender chicken. Leave to simmer for a few minutes until the chicken strips are completely smothered in the rich tomato sauce and thoroughly cooked through. While the chicken sizzles, grab the 100 ml of cool sour cream and stir in the flavourful herb seasoning. Mix it up to for a creamy herb topping to finish off the fajitas. Warm up the soft, toasty tortillas by piercing the packaging and microwave on full power for 35-40 seconds (cooking time may vary depending on microwave). Or fire up the oven, remove the packaging, separate the oven baked tortillas and wrap them in foil. Leave for 10 minutes at 200°C (180°C for fan assisted ovens), gas mark 4. Keep them covered and warm until ready to serve. Get the whole family round the table and load up the soft, warm tortillas with juicy chicken and cool herb sour cream, let everyone tuck in for a Mexican feast without the heat.